Why are DOTs in love with one-way frontage roads? Funny thing is that I really never drove on a one way frontage road until I was in Texas. We have mostly (if not exclusively) two way frontage roads here in Minnesota. I think this question really has two parts, the first of which is to explain the frontage road. Frontage roads are an attempt to improve the road function on a stroad while getting as much of the street function as possible. 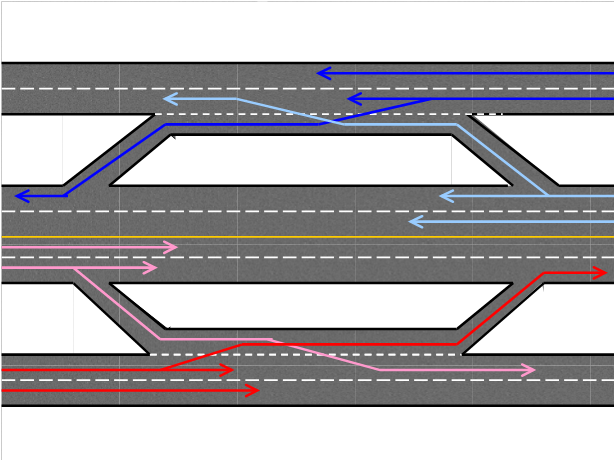 It is the engineering professions response to the multi-way boulevard (or the multi-way boulevard is the intelligent response to the frontage road). In an auto-centric system, roads move automobiles quickly from one place to another. There is a strong incentive for local governments to mine the roadway investment for economic development purposes, essentially reducing the ability of the road to move automobiles quickly (not to mention safely) by adding as many accesses as possible along it. This costs the local government relatively little but the tax base benefits them quite substantially (at least in the short term). These transactions are, in essence, a transfer of wealth from the public via the roadway investment to private property owners with the local government as a middleman beneficiary. Quite a messed up system. Since DOT’s are powerless to resist the political pressure to degrade roadway investments in this way – even though adding a bunch of accesses is incredibly unsafe and by unsafe I mean people routinely die in these stroad environments – they have chosen to mitigate the problem the way they mitigate all problems: by spending more money. In this case, they build frontage roads in an effort to limit the number of direct accesses onto the highway. This allows the DOT to have kind-of-a-roadway while the local government and the private property owners can have kind-of-a-street. Everyone “wins” except the taxpayer who has to pay to build and maintain all this unproductive asphalt. 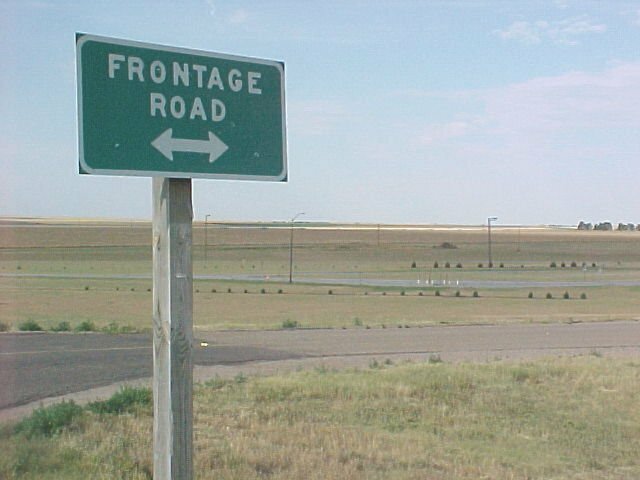 Every time you see a frontage road you should understand that you as an American taxpayer are getting financially screwed. So why make them one way? The answer is almost comical in a Keystone Cops kind of way. What is being done is that the DOT is trying to assert – or recapture -- some road characteristics lost on the highway within the frontage road. By allowing drivers to move at higher speeds on the frontage road, we can nominally improve the first and last few seconds of each trip. Of course, this effort is totally misplaced and fruitless, but DOT’s can be mindlessly obsessive in this way. If we are going to build and maintain quality auto transportation systems, we need to build great roads that move people quickly from one productive place to another AND we need to build productive streets that provide a platform for long-term wealth creation within a community. Frontage roads have no real role in a productive transportation system. After putting this together I was sent three articles about MoDOT's attempt to convert two way frontage roads to one way. The typical struggle between road funtion and street function is so clearly evident, as is the eventual stroad outcome. One-way outer roads may be coming to St. Charles after all - along a quarter-mile stretch of Interstate 70 between South Fifth Street and Fairgrounds Road. They're part of a plan to improve traffic circulation in and around the Fifth Street interchange to be unveiled at an "open house" Thursday. Amid continued opposition from car dealers, aldermen voted 7-1 on Thursday night against limiting the south outer road to one-way traffic while continuing two-way traffic on its northern counterpart. And then you have the DOT shoveling money at the problem, doubling down with your tax dollars on a bad stroad design. The County Council also must sign off on the $22 million O’Fallon plan, which would be funded by the federal, state and county governments. The O’Fallon plan calls for making both the north and south outer roads along I-70 one way between T.R. Hughes Boulevard and Bryan Road. There also would be additional I-70 on- and off-ramps, fewer outer road stop lights and revamped interchanges to improve traffic flow. And there are serious people out there actually suggesting we spend more money on this system. No way.